I had been waiting for my family to visit and now they have been and gone ! 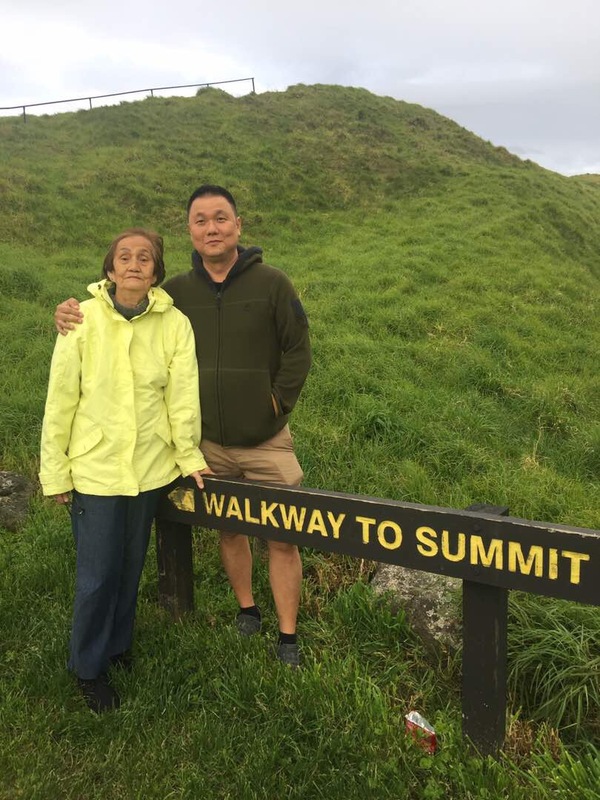 It was Mum’s second trip to New Zealand after seven years. She visited with my sister and hubby. My brother joined them flying from the Solomon Island. This post is a collage of sweet memories during their visit. Mum & my brother after their climb up Mount Wellington. Mum’s first try on driving a ‘car’ (scooter) for easy access at Botanical Garden. A kind neighbour offered us free grapefruits. Pick your own. A visit to Otara market in the rain. Mum & sis at Fo Guang Shan temple in Flatbush. Fresh Clevedon Oysters – I seemed to be the only one enjoying it. Wonder Women – Four Generations. This entry was posted in present, Travel and tagged chinese temple in Auckland, clevedon oysters, fo guang shan flatbush, Mount Wellington NZ, NZ Grapefruits, otara market, weekly photo challenge waiting by Little Borneo Girl. Bookmark the permalink. Family – get togethers few and far between are so previous. Lovely family! Great photos! Wow look at those fruit trees!!! Wow…so happy for you that you were able to spend time with your folks, Jess! Four generations? How precious! Yes, felling blessed. Thank you for visiting my blog and your kind comments. Your photos reflect a quite wonderful family time together. You will no doubt cherish them and the visit for many years. Thank you. Certainly will and so thankful to WP that we can record and share our precious moments. Thank you for reading.